Visit the fascinating remains of a Roman garrison town, here you can explore the granaries, markets, workshops and temples and learn how the Romans lived. The first Fort was built in Corbridge around 85AD and some point in the second century it was replaced with a town, the remains of which you can now visit. A large number of items that were found while excavating the site are now housed within the museum. This is an English Heritage site, so access to the remains of the town and the museum are free if you are members. It's easier to see the layout of the town from above, the picture on the right is a google satellite image showing how large the site is. The building to the left of the picture is the museum. Corbridge Roman Town is located just outside the town centre, to the West on the banks of the river. For more information visit the English Heritage Website. Postcode for your SatNav: NE45 5NT. One of Northumberland's less celebrated Castles, but it is still definitely worth visiting if you are in the Corbridge area. It's located just a mile outside the Town on the banks of the river and is almost completely still in tact, it's one of the Country's best examples of a 13th Century Manor House. Originally the Castle was not fortified, but not long after it was built there was the outbreak of Anglo-Scottish war and this immediately became necessary. So in essence it isn't actually a Castle and was not intended to be, it is a heavily fortified Manor House that has come to be known as a Castle. Whatever you prefer to call it, there is an interesting History to be explored, having been raided, burnt and changed hands many times throughout the centuries. Another English Heritage gem that should be appreciated, it really is a beautiful setting in the woodland and perfect for a family day out or picnic. English Heritage members enter free of charge, postcode for your SatNav: NE45 5PJ. Corbridge serves as a great base for walking around Hadrian's Wall Country. The Corbridge Village Trust have put together a walk that takes you around Corbridge to discover the Town in all it's glory. Visit St Andrew's church in the town centre to pick up an information leaflet. There are many other walks from Corbridge, many of which are detailed on the Tyne Valley Train Trails website including a walk that takes in Corbridge and Aydon Castle. Their website is an excellent resource where you can download maps of all their walks in the area including their Top 15 walks in Hadrian's Wall Country. Cycle routes are plentiful as well in the Corbridge area. The National Cycle Network route in the area is Hadrian's Wall (Route 68). Other National Cycle Routes that run through Northumberland include Route 1 (Coast and Castles South) and Route 68 the Pennine Cycleway. Or you could just simply take to the beautiful country lanes and enjoy the scenery around Corbridge, particularly to the South. Northumberland has a plethora of excellent golf courses and the Corbridge area is no different. Just a short distance away are the championship courses of De Vere Slaley Hall. Set in 1,000 acres of woodland the location is as magnificent as the golfing opportunities. Other courses within striking distance of Corbridge include Hexham Golf Club which is just a few miles along the A69, Tynedale Golf Club, Prudhoe Golf Club and Stocksdale Golf Club. For a full listing of all the wonderful golf courses that Northumberland has to offer, visit our Golf Page. Corbridge has a fine selection of Art Galleries and shops for it's size. The Balman Gallery is based in the listed Town Hall Buildings of Corbridge, with five rooms over two floors. There is a wide range of work on display in the gallery set up by Andy Balman who the Daily Telegraph described as the 'irrepressible entrepreneur' for his 25 years of work in the creative industries in the North-East. On Main Street, within Corbridge Antiques, is James Alder Fine Art who sell Victorian oil paintings and watercolours by North-East, British and European artists. There are also Arts and Crafts shops Connell and Hart & Crystal Imprints on Watling Street and Forum Books and Crafts on Hill Street. In the small Village of Newton, a few miles to the East there is FiFieFoFum Fine Art. Established in 2003 in a disused farm building, it is now one of the leading art galleries in the North-East. 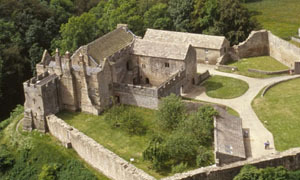 Between Hexham and Corbridge is Dilston with it's Castle and Chapel which belongs to the North Pennines Heritage Trust. The are located in the grounds of Dilston College and their is ample parking and a cafe for refreshments. Also in Dilston is the Dilston Physic Garden, an unusual garden open to the public that brings herbs to life like no other! The garden has over 800 medicinal plants and is open Wednesdays and Saturdays from mid April to Mid October.